When the Fujifilm X-T10 was first introduced, I thought it was cool of course but didn’t really think that I would want one. Then the more I read about it and the more that I realized that it was basically just a smaller X-T1, I thought maybe I’d try one as a supplement to my X100T in my “carry everyday” bag. I ended up getting one on trial, and after playing with it for a bit, I decided I would get one. I got the two-toned Silver & Black version to change it up a bit since both my X-T1 bodies as well as my X100T are all black. I love how the two-tone version looks like an old school film camera…something like my Nikon FG body, especially when I put a Nikon 50mm lens on it via a Nikon F/Fuji FX adapter. Happily, the 16-50mm kit lens that came with mine is the black version…some of the pictures I saw online of the two-tone kit had the uglier silver 16-50mm lens. While not as good as the Fuji 18-55mm f/2.8-4 “kit” lens that comes with the X-T1, the 16-50mm kit lens bundled with the X-T10 is still a lot better than your usual kit lenses – though I probably won’t use it a ton since I have a lot of other Fuji X lenses to use, as well as my legacy lenses that I enjoy using, I’ll keep the 16-50 in the arsenal probably since they don’t have the best re-sell value. I think there are going to be kits with the 18-55 lens at a higher price…I’d like to see it in kit form with the Fuji 27mm lens – that’d be a great, tiny package. Image quality is obviously awesome since the X-T10 uses the exact same sensor and processor as the X-T1 does…there’s just something about the Fujis that make their image quality so good and (as I’ve said numerous times) film-like. It also comes with Firmware 4.0 factory installed…4.0 is now available for the X-T1 and it is a doozy of an update! Really enhances the AF of the cameras…adds many great AF features – it really makes your X-T1 feel like a new camera. The greatest thing about the X-T10 is that it really is basically just a smaller version of the X-T1 which I love. There’s no weather sealing which to me is probably the biggest difference, but there are a few other differences. Another great thing – it uses the same battery as the X-T1 so I have plenty of spares. It seems the battery life isn’t quite as good as on the X-T1 which to me doesn’t make much sense as the cameras are basically operating the same way electronically – I’ll keep my eye on that to see if it’s an actual issue or just my imagination. UPDATE 7-14-2015: It must’ve been a fluke or my imagination – battery life now seems to be at least as good as with my X-T1’s, if not a bit better! I set the X-T10 up so it basically works the same as my X-T1 bodies…I have the four-way controller on the back set up to control the focus spot no matter which of the four buttons I press. The back dial is set up to bring up the “zoom in” focus aid when pressed in, and the front dial is set up to change focus modes when pressed…but I may change that to something else after playing around a bit since I often use manual focus lenses on the camera and that won’t be all that useful to me. Really, I was able to set the X-T10 up to be just about the exact same as my X-T1’s which is wonderful – when you can keep the differences between bodies as little as possible, it makes bouncing back and forth between them so much easier. It is smaller than the X-T1, and it’ll be up to you whether or not that’ll work. For me, it’s about on the edge of too small…I think when I add either the Fuji handgrip or (hopefully) a cheaper third-party version, it’ll help. I haven’t held an X-T1 without a vertical battery grip in ages though so the X-T10 seems really small to me. It’s actually kind of cool how small and solid it is, like an old Olympus OM body, but I personally do find the X-T1 more comfortable…of course having the vertical grips on both of mine (which are fantastic) makes them much more comfortable. There doesn’t seem to be any chance of a vertical grip for the X-T10 as there are not electrical contacts on the bottom like on the X-T1. I don’t think I’d enjoy the X-T10 as much if it was going to be my day in, day out camera to use for studio shoots or something like that, but as my “toss in my bag” camera to have with me in addition to my X100T and the occasional street photography excursion, I really think it’s going to be great. 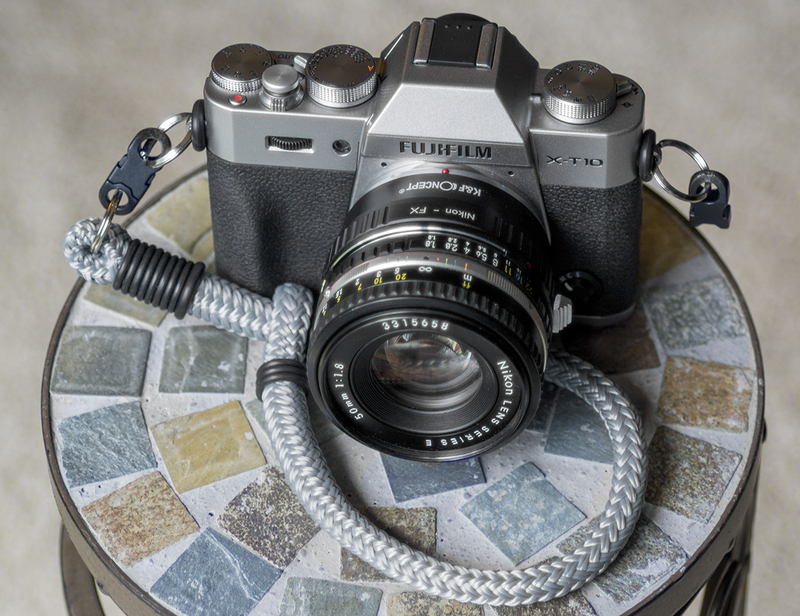 While I often use my X-T1’s with no neck strap or wrist strap, I will be using a wrist strap like I use with my X100T…a Lance Camera Straps “Lug Wrist Strap” in a great silver/gray color that looks great with the two-toned X-T10 body – it’s not one of Lance’s color options but they were able to hook me up with one. IMO, they are the best straps out there…super strong and super comfortable. Like on the X100T, I am utilizing small “pinch type” quick release buckles so I can switch from wrist strap to my Lance neck strap rapidly. I don’t seem to miss the dedicated ISO dial – ISO is easy enough to access via the Q-button, or you could always program one of the customizable function buttons to bring up the ISO menu. Seems though that without weather sealing there could’ve been some kind of option to include ISO selection on the Drive dial…something like on my old Minolta body where you set the ISO by pulling up on the shutter speed dial and the ISO value was seen in a little window on the dial. Of course corners had to be cut here and there to deliver the camera at it’s price point. Fuji’s Auto-ISO implementation is so good though, a lot of the time I am actually using that with a max of 3200 set with a shutter speed minimum of 1/125 and it works just fine. The X-T10 also has a built-in popup flash that you’d be forgiven for missing if you did…it’s that well integrated into the body! It pops up with the flick of a switch by the Drive dial. Supposedly it’s the same flash as on the X-E2 and some have said it’s not very good, but for what I would ever use a popup flash for it’s fine…a little bit of fill flash is what these kind of flashes are good for, not illuminating a dark room! Not being weather sealed allows the inclusion of the flash, as well as the threaded shutter button like the X-E1, X-E2, X-Pro1, and X100-series cameras all have. The viewfinder is the same as on the X-E2 body, and it’s not as good as the X-T1 viewfinder obviously, but honestly I find the viewfinder great…Fuji has always had great viewfinders IMO. Oddly, and it may be my imagination, but the eye sensor to switch from LCD screen to EVF and back seems a bit sluggish to me…I’ll have to keep an eye on that to see if it’s legit or my imagination. UPDATE 7/14/15: It does still seem slower to me than the EVF on the X-T1…especially when you first power the camera on and bring it up to your eye – it seems to take really long to switch to the EVF. I’ve been testing using the camera with just the EVF-Only option, to see if I’d like it that way and thinking that it would extend battery life a bit by not having to power the big LCD screen on the back, but of course all menus will only show up in the EVF. It would be nice if when you hit the Menu button or the Q-button the view would default to the back LCD screen even in this mode. The X-T10 makes a great backup camera if you already have an X-T1, and might be perfect for you if you’ve been wanting an X-T1 but couldn’t afford one, or you don’t need the weather sealing of the X-T1, or you won’t ever use a vertical grip. Something to keep in mind – if you have bigger hands and find yourself torn between the two, if you get the X-T10 and then find that the Fuji add-on handgrip is a necessity, being overpriced it’ll had $130 onto the price of the X-T10 bringing it that much closer to the price of an X-T1. I’m hoping we see third party options for handgrips and Arca-Swiss compatible L-Plates for the X-T10 soon (which I’m sure we will). Basically a smaller, cheaper X-T1; wonderful image quality; great looking body; great user interface. No chance of a vertical battery grip; Fuji’s own handgrip WAY to expensive; would be great if you could get a “kit” bundled with the Fuji 27mm instead of the 16-50mm.